The first images to emerge from the damages and destruction caused by Tropical Cyclone Winston in Vanuabalavu came from the neighbouring island Mago – pri­vately owned by actor Mel Gibson. The pilot of Mago’s private plane, Captain Neil Covert had flown around the island and took photographs of the damage a few days later. New Zealand Airforce P3 Orion reconnaissance flights began on February 21 and con­tinued for several days. Aerial photography, including for Northern Lau, was passed daily to the disaster coordination centre in Suva. A satellite phone was dropped from the aircraft to the community at Lo­maloma providing communications with the outside world. On February 24, 2016, a Fijian Gov­ernment medical assessment team in­cluding a New Zealand response team, flew over to Vanuabalavu. The next day, Vodafone New Zealand arrived via a private charter to set up free commu­nications so the islanders could con­tact their families. From February 27 a joint New Zea­land assessment team including New Zealand Defence Force, Medical Search and Rescue and the New Zea­land High Commission arrived on the island to carry out an assessment that lasted four days. Two days later the HMNZS Wellington arrives in Vanua­balavu to chart the reef and passages in preparation for the arrival of the NZHMS Canterbury. The HMNZS Wellington carried out emergency relief and recon missions to the Northern Lau islands over the course of two weeks. The people of Va­nuabalavu worldwide also organised to visit the island with as much help as possible for each of their families and villages. A special trip was organised with the MV Princess Civa. Upon arrival at the jetty in Lomaloma, there was already a Tongan navy vessel and landing craft with personnel on the ground. Early morning Pacific Marine and Civil So­lutions barge Tama and its tow vessel Viking Star arrived to do urgent re­pairs to the jetty. A few hours later, early on March 4, the HMSNZ Canterbury could be seen on the horizon from the beach at Matafele in Lomaloma, arriving with relief supplies and an engineering team for clearance and reconstruction work. Lomaloma was an exciting hive of activity. The individual relationships of both New Zealand and Vanuabalavu and PBS with Vanuabalavu go back for years. It was one of PBS’s company’s, Pacific Marine & Civil Solutions that carried out a major upgrade of the Lomaloma Jetty and then repaired it immediately after TC Winston to allow for an acceleration of response efforts. It was also PBS that rebuilt the Lom­aloma Hospital and nurses quarters – which both withstood the Category 5 Winston. Several years ago, the then Adi Maopa Junior Secondary School management was trying to have the school upgraded to a proper secondary school. In order to qualify for the upgrade, Adi Maopa Junior Secondary School needed to have workable science labs with the appropriate apparatus. This final requirement was supplied by the New Zealand High Commission.Adi Maopa Secondary School is now up to Form 7 level with a Vocational Unit as well. 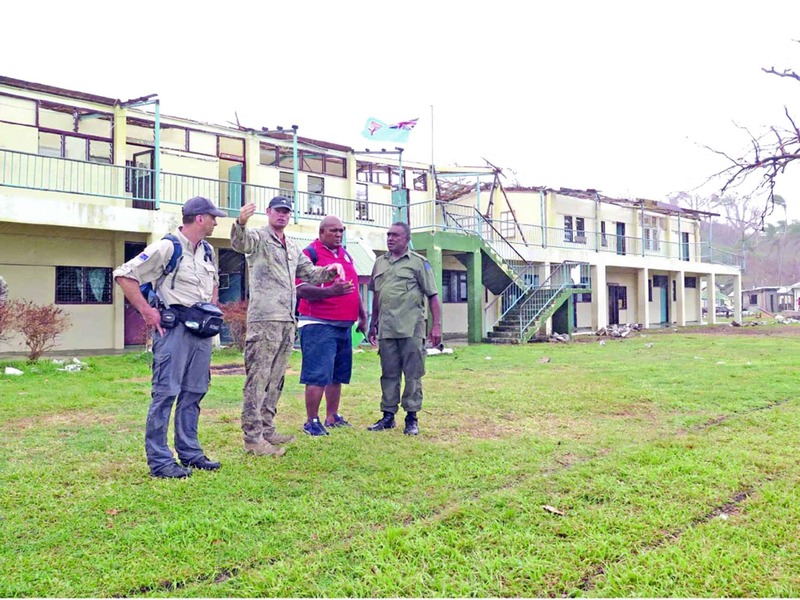 Following emergency response efforts in the Northern Lau Group, the Government of Fiji accept­ed an offer of assistance from the New Zealand Government to focus on the same geographical area for recovery and rebuild work. The NZ Ministry of Foreign Affairs and Trade (MFAT), through the NZ High Commission in Suva, contracted MWH to act as engineer for the project. A construction tender was advertised internationally, and several propos­als were evaluated to identify the best company to undertake the construc­tion work. On October 17, Pacific Building Solu­tions received a Letter of Intent from the New Zealand High Commission in Suva for the contract of the work of rebuilding in Vanuabalavu. The con­tract for PBS was to design and build. Within days, a team from PBS and the New Zealand High Commission visit­ed the islands for its initial rounds of customary obligations to Community Leaders. The first round of site inspections by PBS was also carried out on this trip. Towards the end of January, 2017, PBS mobilised on the ground in Vanuaba­lavu. An initial team of 35 along with a management team arrived to set up at the FRA Depot in Lomaloma. Michael Fairfax, managing director of PBS said: “We designed the camp taking into account that most of our workers were coming in from urban centres, so we provided everything that would be catered for in their homes, 24 hours water and electricity supply, a mess hall and lounge with Sky Pacific, all meals, housekeeping and laundry services. The final count of workers for the project at its peak in construction was 110 Suva- based workers living in camp and 41 local workers sourced from the community. In addition, PBS built a Mess Hall and Lounge for its camp. 106 work­ers were housed in, 17 large and four single model units that were sourced through former Australian Fiji rugby league star, Petero Civoniceva. Each of the units were named after each of the 17 villages in Vanuabalavu. In a little of over 14 months, the TC Winston Repair and Reconstruction Project has seen a total of 29 brand new buildings and 45 repaired ones plus installation of water tanks. Adi Maopa Secondary School, the only secondary school on the island now boasts one of the best structures in the entire Lau Group if not the coun­try, at 67 metres in length and eight me­tres in width, it houses 10 classrooms. It will also act as an evacuation centre in times of need. Daliconi Village School has acquired a new five-classroom building with a repaired kindergarten and teachers residences. Mavana District School now has a new five-classroom build­ing, three new two-bedroom teachers residences, one new kindergarten and a two-pan ablution block. The Lomaloma Cluster works includ­ed Adi Maopa Secondary School, Adi Maopa Primary School, a new health building in the Lomaloma Hospital compound and repair works to the residences. Of great significance at Adi Maopa Secondary School as well, was the demolition of the top floor of the old Administration block being replaced by a friendlier designed roof struc­ture. All sites have buildings designed to withstand cyclones and to be used as evacuation centres. All of the new school buildings come complete with disability friendly ramps. A first for new school buildings in Fiji. The most challenging of the project has been the reconstruction on Ciko­bia Island about 18km off the coast of Lomaloma. The school site sits on a hilltop overlooking the village. The island doesn’t have a jetty and its only source of water is the rain or a beach spring that is a 2 kilometre walk from the village. The beach spring water is also only accessible at low tide – so people have to walk there at low tide, fill up buck­ets of water and place them on a hilly patch. The filled-up buckets of water are then collected at high tide by a boat. PBS devised a pulley system with a pontoon to transfer materials from the barge to the shoreline where it was stacked. It then had to be carried uphill by workers for the total recon­struction of all the structures at Ciko­bia Village School. The school now has one new two-classroom block along with a Comput­er Room and library with a brand-new head teacher’s residence. Large 10,000 litre water tanks with bases were also installed to assist with their water problem. The most significant reconstruction of the project has been at Delana Gov­ernment Station in Mualevu. New buildings include the Meteoro­logical Service weather station and residence, the Vanuabalavu Police Station and a residence, Department of Agriculture office and residence, Mualevu Health Centre residence and three structures for Water Authority of Fiji including a fuel and chemical shed facility. Mualevu Village School also has a totally new six-classroom structure, a two-classroom structure and a new teachers residence and several other repaired residences and school build­ings. 10,000 litre water tanks were also installed here for ease of drinking wa­ter access for students and teachers. 12 out of the 29 project brand new buildings have been at the Delana Gov­ernment Station in Mualevu. The project has also assisted the local community pumping over $500,000 into the Vanuabalavu economy through creation of employment for locals and purchasing of local foods and services. As the last batch of Team PBS demo­bilizes from the island, the locals have only great things to say of the assis­tance by the New Zealand government to its people. A Sawana Villager, Seko­na Tovehi said: If we were to rebuild our schools on our own it would take more than two generations of people to do it. We are forever grateful to New Zealand.